Laser teeth whitening, also known as power whitening, has quickly become a popular means of beautifying discolored teeth. This procedure is mainstream now since it is completely safe and does not damage the gums or tooth structure. Here is a look at what the laser teeth whitening process involves. The laser teeth whitening procedure commences with the placement of a rubber dam within the mouth. This rubber dam serves the purpose of protecting the gums. The dentist then applies bleaching gel to the teeth. This gel has regular pH levels. The next step in the process is the activation of the mineral accelerant within the gel. The process causes the whitening gel to become oxygen. This is the point at which it covers the tooth enamel and lets the whitening gel penetrate into the lower levels of the teeth for lovely whitening. How Effective is Laser Teeth Whitening? Some patients are skeptical about laser teeth whitening as it seems too good to be true. The truth is this high-tech approach to smile beautification lightens the shade of teeth between five and six shades. In fact, there have been a few situations in which the teeth end up a bit brighter than anticipated. However, this is not a long-term issue as laser teeth whitening does not produce permanent results. The point in using a laser is to facilitate the whitening process through an interaction with the gel. All in all, this approach to teeth whitening produces meaningful results in about half an hour. This short period of time is a large part of the appeal of laser teeth whitening. Laser teeth whitening is not advised for those who have sensitive teeth, receding gums or other significant issues with the teeth. Furthermore, it is not recommended for those who have not reached 16 years of age and those who are pregnant. Laser teeth whitening makes use of a powerful bleaching gel activated by the laser. The gel generates timely and eye-opening results Do not be concerned with the safety of the bleach in the hydrogen peroxide gel. The American Dental Association reports the bleach for this process has a concentration level of 25-40 percent. Certain precautions are taken to minimize tooth sensitivity during the whitening process. Furthermore, the dentist uses everything from desensitizing pastes to the aforementioned rubber dams and cheek retractors to protect the lips, gums and additional oral tissues. The amazing results of laser teeth whitening combined with the little bit of time required for treatment justify a comparably high price. 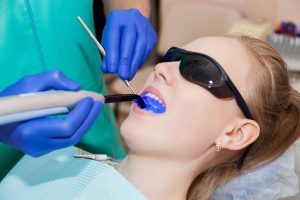 Though laser teeth whitening is certainly more expensive than some other options for teeth whitening, it is well worth it. You will be perfectly safe throughout this treatment. Furthermore, your teeth will look fantastic once it is complete. You will also save plenty of time in the dentist's chair. Spend that extra time at work, with your loved ones or doing something else enjoyable. Please call Des Moines Dental Center today at (206) 408-8541!